Avomine tablets contain the active ingredient promethazine, which is a type of medicine known as an antihistamine. Antihistamine reduces allergy symptoms. Avomine also blocks receptors in an area of the brain called the vomiting centre, reducing nausea, the urge to vomit and vomiting. Avomine is used to treat motion sickness, also known as travel sickness, a common disturbance of the vestibular organ that is caused by repeated motion and is characterized by symptoms such as dizziness, nausea and vomiting. Motion sickness can be brought on by traveling in any type of vehicle (car, boat, plane, train). Avomine helps to suppress the symptoms of motion sickness and makes traveling much more comfortable. 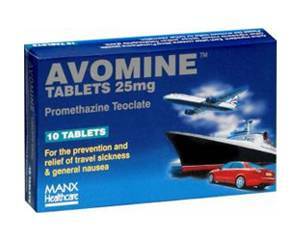 Avomine tablets are used to prevent and relieve motion sickness. The tablets should be swallowed whole. To prevent motion sickness Avomine needs to be taken at least one or two hours before traveling. However, it can also be taken once a journey has started if you begin to feel sick. Avomine normally takes 20 minutes to take effect. The effect lasts for six to twelve hours. When motion sickness symptoms are acute: one tablet, followed by a second tablet in the evening. For children aged 5 to 10 and the appropriate dose is determined by a doctor. Avomine is not suitable for children under the age of five. Eye problems (burning sensation, tired eyes). Consult your doctor before using Avomine if you are pregnant. Avoid taking it during the last six months of pregnancy. Do not take Avomine if you are breastfeeding as it may cause respiratory problems in newborn babies. Avomine is known to cause sleepiness, tiredness, dizziness and blurred vision. Do not drive or operate machinery while taking this medicine. Effects such as drowsiness or sleepiness are made worse by alcohol. It is therefore important not to drink any alcohol while taking Avomine.